It was neither a 300-yard passing game nor an outing where his completion percentage dazzled national media; however, his toughness and leadership reigned supreme on last week. Alabama head football coach, Nick Saban told the press after the team’s 29-0 victory over Louisiana State University that Tua Tagovailoa “does not have a knee injury”, despite every attempt the Tigers’ defense took to knock the sophomore quarterback out of the game. He took some cheap shots at the conclusion of plays – including one to the sacred jewels – and while the officials never made a call, Tagovailoa continued to battle the Tigers and its fan base inside the pandemonium environment known as Tiger Stadium. Regardless of him completing just 59.5 percent of his throws (25 of 42 passes), the Heisman frontrunner guided the Crimson Tide’s offense to an efficient performance on third down as it converted eight of 14 attempts. Tagovailoa threw for 295 yards with two touchdowns, while assisting wide receiver Jerry Jeudy to his fourth 100-yard outcome of the season. The sophomore caught eight passes for 103 yards and made LSU’s secondary look foolish on the majority of his plays after the catch. Much concern was made about his knee, especially with him grabbing the brace on every other play, but all of that was quickly forgotten after he rushed for a career-long 44-yard touchdown in the third quarter. 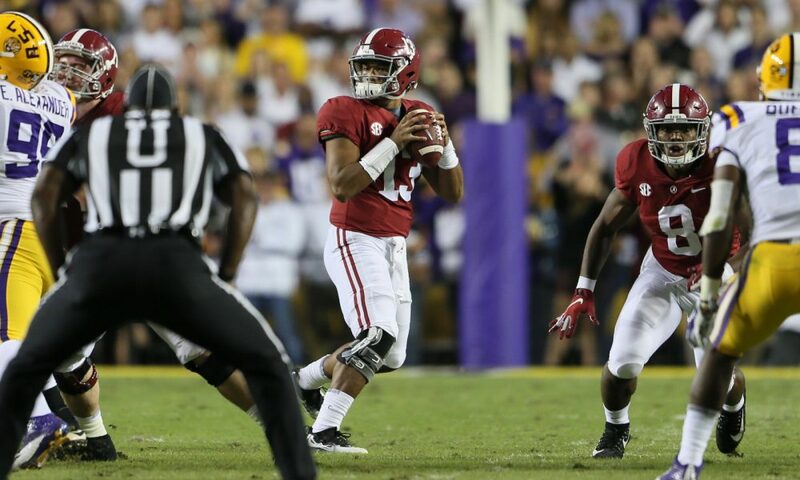 Reminiscent of his friend and backup, Jalen Hurts, Tagovailoa noticed a void in the Tigers’ defense and out ran the unit to the painted grass. Saban did not jump into his arms following the Tide’s demolition of LSU, but he did praise Tagovailoa for his efforts. “Tua played really well,” Saban said. While his 27 touchdown passes stand fourth all-time in school history for a single-season, Tagovailoa is responsible for 30 scores this season. He is seven touchdowns shy of supplanting Hurts for most all-time for scores in a season for the Tide.